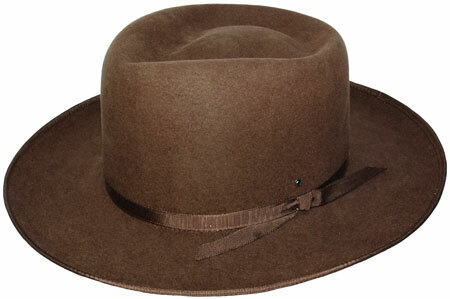 The Akubras with an open crown, such as the Bushman, allow you to put your own personal bash or crease in the crown. 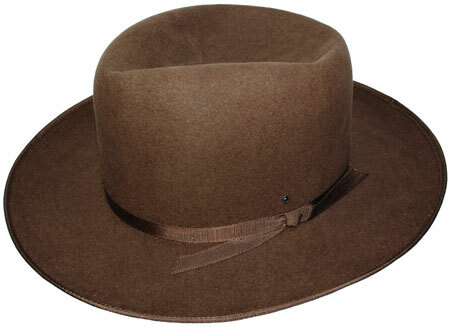 A hat maker would use steam to make the shape permanent but steam may also shrink the felt. The better way for those who are not hat makers is to put in a preliminary shape, then when the hat is damp from the rain adjust it to the desired final shape and let it dry. This not only avoids shrinkage problems, but also lets you try out the preliminary shape and change it if needed. 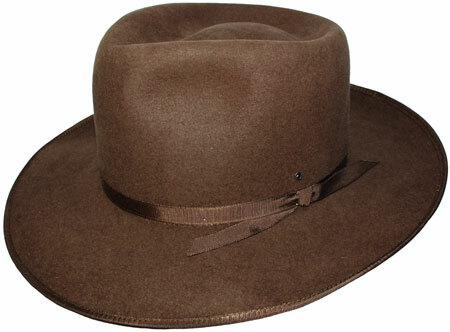 The Bushman is often worn with a pinched telescope bash. Step 1. Start with the open crown Bushman. Step 2. First push in the top to form a triangular shape pointed towards the front with the section towards the back rounded to the shape of the crown. The front may be one-half to one inch higher than the rear. Step 3. The inside of the pushed -in top is then raised in a domed shape so that it does not touch the head, leaving a valley between the dome and the sides. The top of the dome should normally be about level with the top of the sides, a little above the top of the back. Step 4. Two side dents are put in near the top of the front, and the front of the brim snapped down.